The game had many stars...Jaime Garcia, Aaron Judge, David Robertson, Todd Frazier, but it was Aroldis Chapman who brought home the victory with his 5-out save that included working out of a one-out bases loaded jam in the top of the 8th inning as the Yankees held off the Minnesota Twins. I've not been a very big fan of Jaime Garcia but he delivered on Monday night. In a game that looked like a mismatch on paper (Garcia against 15-game winner Ervin Santana), Garcia was just a tad bit better on this night. It was evident that he brought his "A" game when he struck out the side in the first inning to start the game against his former team of 6 days in July. Aaron Judge gave Garcia an early lead when he belted his 44th homer of the year, a solo shot to right. It was Judge's 97th RBI of the season. The Twins tied the game in the top of the 5th inning. Eddie Rosario led off with a single to second on a ball that was deflected off the glove of a diving Didi Gregorius into shallow right field. Eduardo Escobar singled to right, but Aaron Judge's slight bobble of the ball (ruled an error) allowed Rosario the time he needed to race around to third base. Robbie Grossman hit a grounder to third. Todd Frazier fielded and threw to second for the force out on Escobar but Rosario scored and the game was tied. Garcia was able to get the first two outs in the top of the 6th, but when he gave up Joe Mauer's single to right, his day was done. David Robertson, ready and waiting, came in and struck out Byron Buxton to end the Twins' side of the inning. Garcia probably wished that he could have gotten Mauer out because the Yankees scored the go-ahead run in the bottom of the 6th inning. Chase Headley singled to center on a ball that was deflected off the glove of second baseman Brian Dozier with one out. Starlin Castro singled to left, with Headley moving to second. With Jacoby Ellsbury at the plate, a wild pitch by Ervin Santana allowed the runners to move up to second and third. Ellsbury was then intentionally walked to load the bases. Todd Frazier's sacrifice fly to center scored Headley and the Yankees had a 2-1 lead. 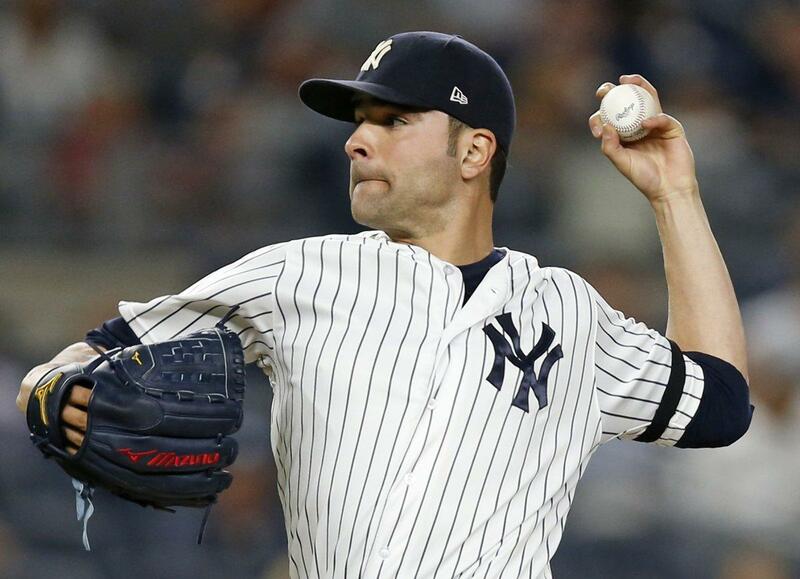 The Twins made a pitching change and brought in Trevor Hildenberger who retired Greg Bird on a ground out at first so the Yankees were unable to push any further runs across. 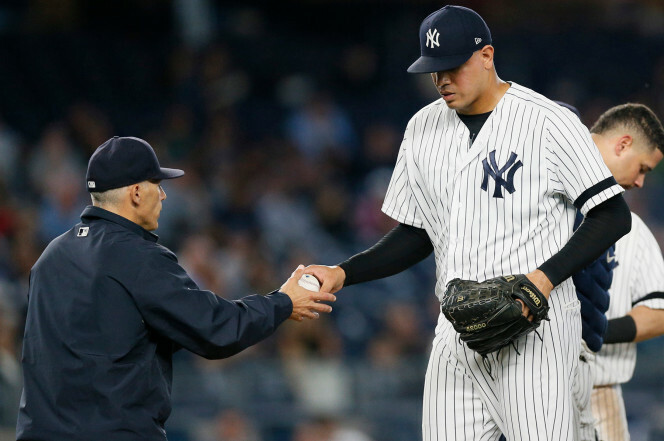 Dellin Betances replaced the highly effective David Robertson to start the 8th inning and the drama began. He hit the first batter, Robbie Grossman, with a pitch to the hip. Zach Granite pinch hit for Jason Castro and moved Grossman to second with a sacrifice bunt. Max Kepler pinch hit for Ehire Adrianza and drew a walk on four successive pitches. After pitching coach Larry Rothschild visited the mound, Betances threw a wild pitch that advanced the runners to second and third. Larry, your talk didn't work! Betances proceeded to walk Brian Dozier, after almost striking him out on a foul tip that Gary Sanchez was unable to catch earlier in the at-bat, and the bases were full with only one out. Finally, Joe Girardi realized that it was not Dellin's night and mercifully made the call for Aroldis Chapman. Chapman proceeded to strike out the dangerous Joe Mauer on three pitches and got Byron Buxton to jump on the first pitch for a fly out to right to end the threat. Chapman had averted disaster in shutting down the Twins on four pitches. Whew! No wait, a BIG WHEW! Chapman easily retired the Twins in the top of the 9th, with the radar gun reaching 104 mph. His swinging strikeout of Eduardo Escobar ended the game. The Yankees win! The Yankees (83-67) were unable to make up any ground on the Red Sox. Boston, despite falling behind by five runs early, overcame the Baltimore Orioles in extra innings, winning 10-8. So, the Yankees remain three games behind the Sox. The Yankees increased their Wild Card lead over the Twins to five games. I will continue to be critical of Jaime Garcia because I am not a fan of his, but for this game, he pitched well enough to win. 5 2/3 innings, four hits, one run (no earned runs), and nine strikeouts on 85 pitches. An incredible stat, for him, was no walks given his propensity for free passes. David Robertson (9-2), the winner, has the most wins of any reliever. I love his 'Andrew Miller' like attitude (willingness to pitch anywhere, any time). 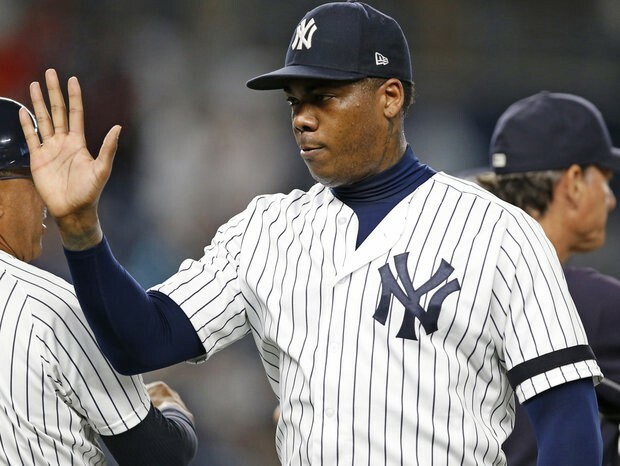 Aroldis Chapman was clearly the game's MVP for his clean-up of the mess created by Dellin Betances. Even better is that he only threw 16 pitches for the five-out save, his 19th, so he'll be ready to go again tonight. 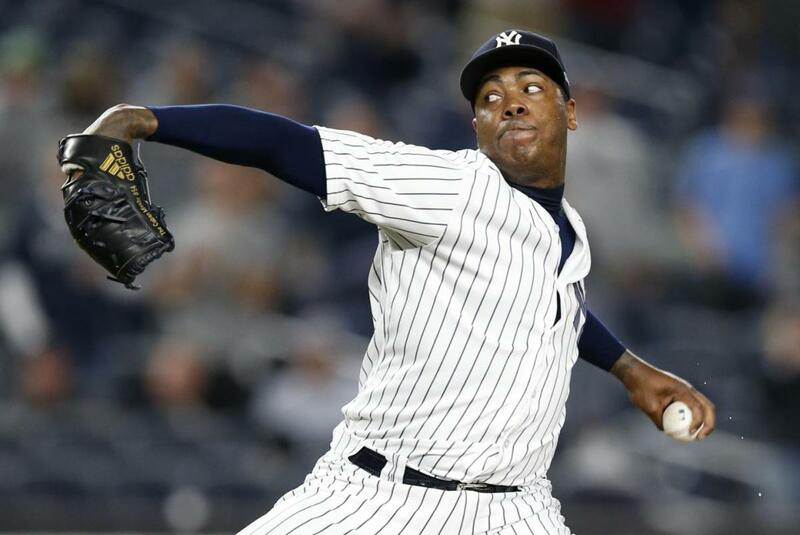 Chapman pitching at the top of his game is crucial for October success. MLB.com has released its revised list of Top 100 Prospects and the great Gleyber Torres is #1! Of course, we already knew that and anxiously await his arrival in the Bronx in 2018. Other notable Yankees and former Yankees include: 23) Clint Frazier; 41) Blake Rutherford (White Sox); 55) Chance Adams; 70) Dustin Fowler (Athletics); 82) Estevan Florial; 84) Justus Sheffield; and 96) Miguel Andujar. Proving that we drafted the wrong son of Dante Bichette Sr, Toronto's Bo Bichette came in at #26. His brother, Dante Jr, has been a disappointment in the Yankees organization and probably will not return. The Yankees took Dante Jr with their first pick (a compensatory pick, #51) in 2011. It was the same year they drafted Greg Bird, Jake Cave and Jon Gray (who didn't sign and was later drafted by the Colorado Rockies). Have a great Tuesday! Let's put away those pesky Twins for the series win! Go Yankees!